Based in Pontyclun (near Llantrisant), Jolly Jesters Playcentre is a children's soft-play play centre offering food and party facilities. Open seven days a week, we offer fantastic facilities for children to come and enjoy! 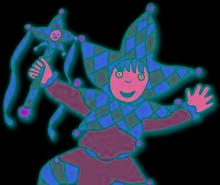 Why not pop in and experience the magic of Jolly Jesters? We have great party facilities at Jolly Jesters Playcentre, catering for childrens parties, disco parties and our amazing Laser Storm parties! We have a full, healthy menu with everything from snacks and lunch-boxes to full meals. For health & safety reasons, we have a height restriction of 4'9" for general play. Play sessions are for 90 minutes. Admission for adults to Jolly Jesters Playcentre is FREE! We are open for fun and games every day of the week!